The WWF Hasbro Action Figure line was an action figure toyline based on the wrestlers of the WWF. They were made by the toy company Hasbro from 1990 to 1994. The toys were made of plastic and each had a signature action move. Most of the moves were repeated in multiple figures. 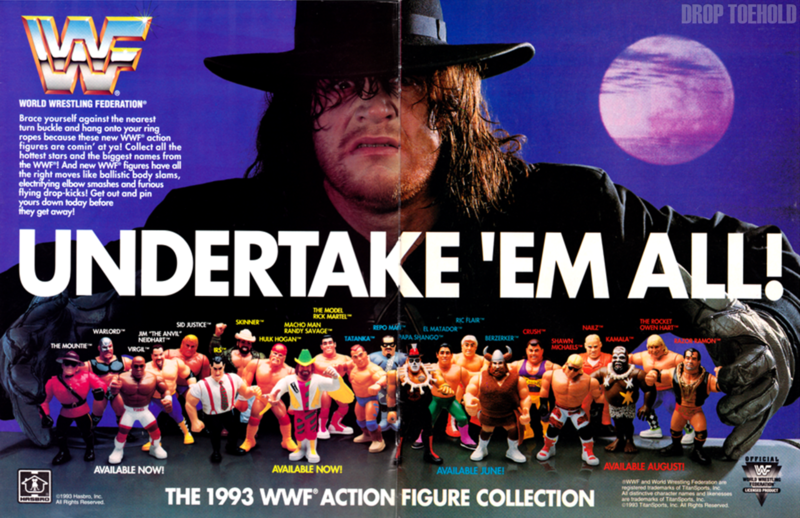 Critics of the line complain that the figures were too "cartoonish" especially coming off of the highly acclaimed Wrestling Superstars line from LJN, which sold the rights to Hasbro after their final run of figures in 1989. These figures have become quite collectible, partly due to the popularity of pro wrestling in general, and the line being introduced at the peak of wrestling figures becoming "collectibles". While some have very high value still in their original package, the most common loose figures ranges from $1–$5. In poor condition most of the line isn't worth very much due to their great abundance. The figures that remain carded can command much higher prices though. In good condition a MOC (mint on card) figure can range from $20 or so for a Jake "The Snake" Roberts or Big Bossman to $200–$800 or more for a Dusty Rhodes to the unbelievable rare Kamala with a Moon on his belly. Other carded figures that can sell for hundreds are the 1992 Series on American Cards such as Brutus Beefcake #2 and Ultimate Warrior #3. A large number of the collection has been released on foreign (usually French, German or Spanish) cards, and are of far less value than cards that are all in English writing, due to their abundance. For example, a 1992 Ultimate Warrior Mint on an American Card can fetch upwards of $150–$175 US, while exactly the same figure on a French card may get around $15–$20 US. Unlike popular belief, there is no such thing as a yellow booted Dusty Rhodes figure. These seen around are figures left in the sun which makes the figure change colour, the 'skin' a darker colour and the boots a yellowish colour. Vielen Dank an insgesamt 40507 Besucher (94347 Hits) seit dem 08.11.2013! !